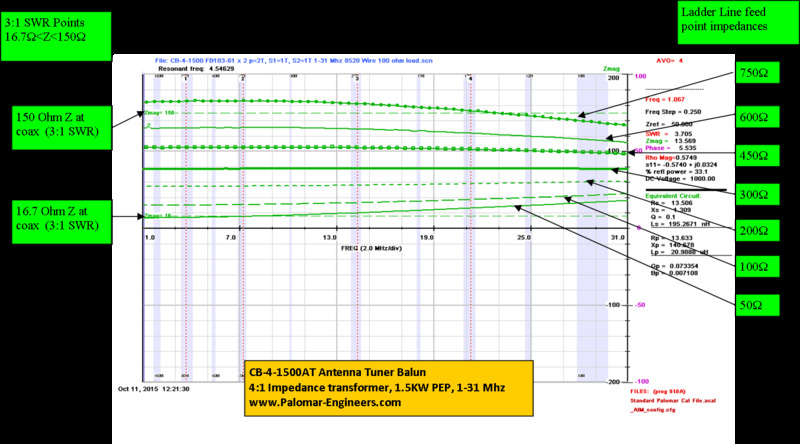 The CB-4-1500 Antenna Tuner Balun is a 4:1 impedance transformer designed to step down balanced ladder line feed point impedances of 600-50 ohms to 150-16.7 ohms unbalanced coax at full legal amateur power of 1500 watts PEP from 1.8 to 31 MHz. 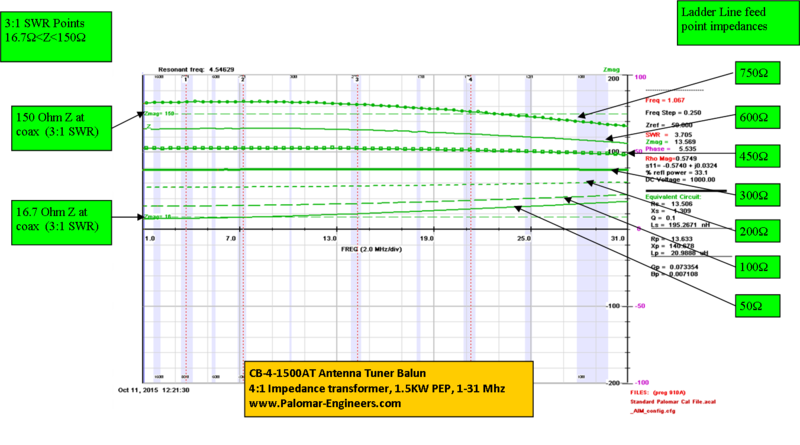 When connected to an antenna tuner output capable of tuning a 3:1 SWR range (16.7-150 ohms for 50 ohm coax) the CB-4-1500AT provides a suitable range for antenna tuner adjustment to 1:1 SWR as seen on the input of the antenna tuner. Also works with 75 ohm coax as well. 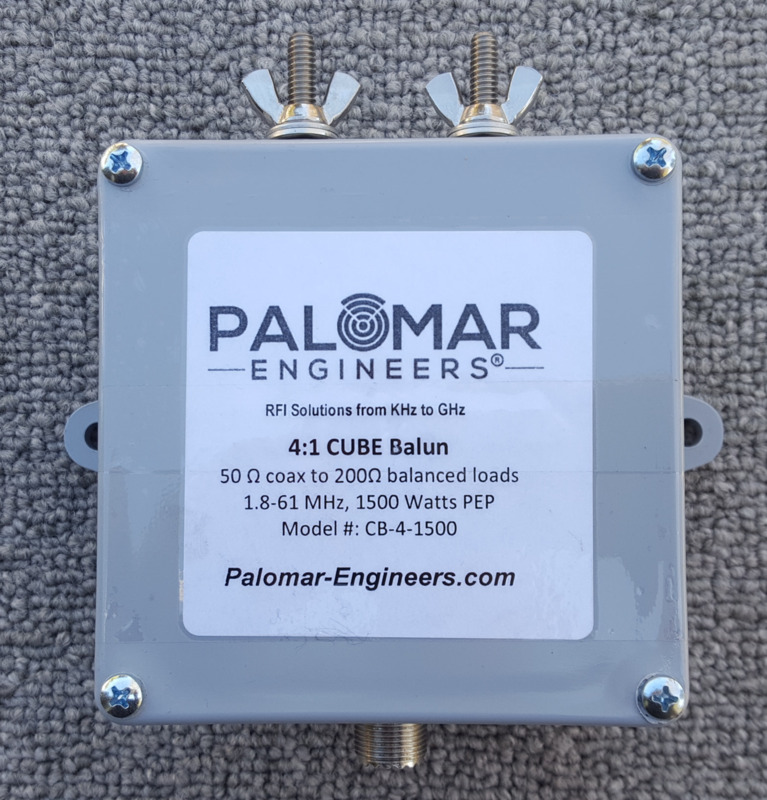 The balun can be used to connect unbalanced 50 ohm coax to ladder line fed balanced antennas like a center fed zepp, log periodic beam, G5RV, full wave loops, etc. It is not meant to be used with unbalanced antennas like verticals, OCF antennas, etc, unless they are also fed with ladder line and the feed point impedance presented to the balun is in the range of 600-50 ohms. The CB-4-1500AT includes a ground lug as the transformer is DC grounded, but RF isolated so that the ground lug can be used to as a sink to a ground rod to dissipate static electricity built up on the antenna and feed line. Typical impedance transformation ratios measured for the CB-4-1500AT are shown in the graph below. Notice that the impedance transformer is useful up to 750 ohms and down to 50 ohms impedance at the ladder line feed point converting these impedances very near 4:1 from 1.8-31 MHz. This impedance transformation covers most feed point impedances seen at the end of the ladder line for typical ladder line fed HF antennas. Keep the coax to transmitter line as short as possible to minimize coax line losses. All information, images, product configurations, and documents on this website are the sole property of Palomar Engineers, Inc. Any reuse or redistribution of the contents of this website are strictly forbidden without authorization from Palomar Engineers, Inc.